Cropping a photo for publication on your blog allows you to remove unneeded or unattractive parts of an image. For example, if you take a picture of a group of friends and then want to include a photo of just one of the individuals in your blog post, you can crop out the other people in the image. Open Picasa and, in the Picasa Library, double-click the photo that you want to edit. Click the Crop button at the top of the Commonly Needed Fixes tab. Select whether you want to crop to a preset size or crop manually. If you’re cropping to a preset size, simply select the size that you want to use from the menu. 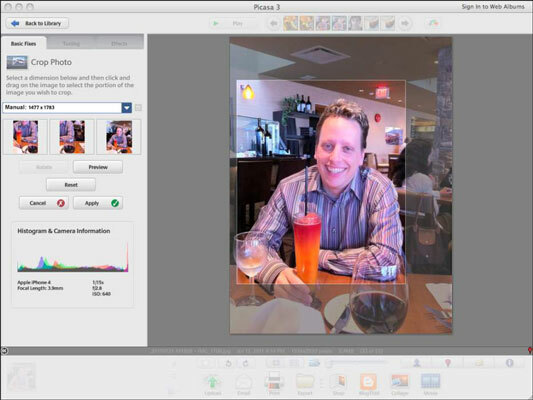 Use your mouse to click and drag over the area that you want to retain in your photo. While you click and drag, the area that will be cropped out of your photo appears slightly grayed out, leaving the portion that will be retained at the original brightness. If you want to start over, click Reset to remove the cropping box that you created. If you don’t want to crop after all, click the Cancel button to exit the Crop tool.